The last few months have seen a constant growth in Nottingham house prices. The city has often been included in the top 3 growth spots by Hometrack which has encouraged numerous property owners to sell whilst prices are high. However, now things are shifting. Nottingham has suddenly seen the highest fall in property prices across the whole of the UK since the start of October. We are down -0.7% on last month, with other city house prices falling including Southampton, Cambridge and Cardiff. Nottingham’s average house price is now £144,200. It’s good news though if you live in Oxford, where almost a 1% property price rise was registered. Nottingham property prices are still up across the last 12 months. Hometrack has recorded a rise of 5%, meaning a house bought for £150,000 in 2016 could have bagged you a £7,500 profit! Are you considering selling your property soon, but haven’t taken advantage of the property price rise over the last few months? Nottingham prices could fall further so it would be worth looking at selling sooner rather than later. You can book a free, no obligation valuation with our Valuers Nick and Richard using the form below. The other slightly troubling news is that interest rates have doubled from 0.25% to 0.5%. This means that mortgage rates could change very soon which would see home owners paying more every month. Rates could also rise further. The Bank of England want a rise to 2% by 2020, meaning we could see multiple small rises over the next two years. If you’re on a Tracker or Standard Variable Rate your mortgage payments will more than likely increase shortly. Our best advice is to seek advice from our broker as soon as possible to find the best fixed rate deal. This could potentially save you hundreds of pounds per year. Find out more about our mortgage advice services. 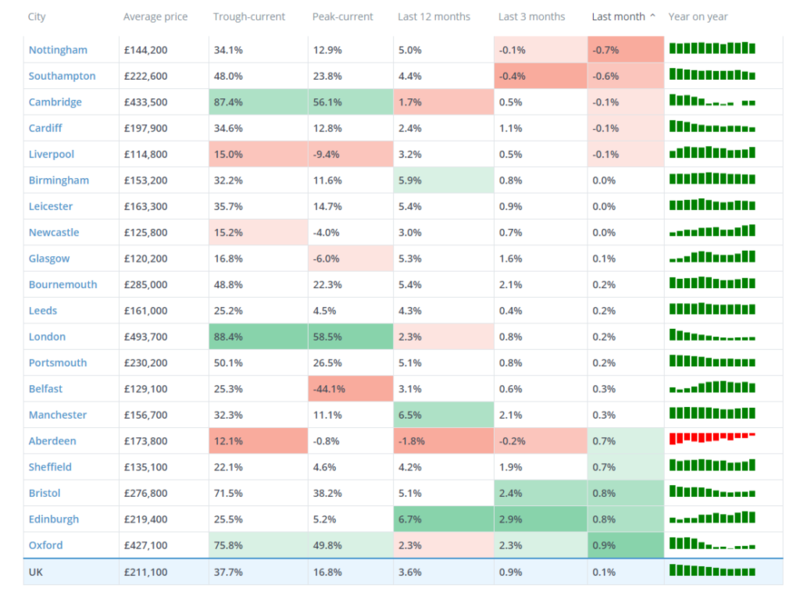 Rightmove have produced their monthly property price report for the East Midlands. This is also down at -0.3%, with average house prices for October 2017 at £207.821. House prices across the East Midlands as a whole are also up in the last 12 months at 4.7%. According to Rightmove, the average time to sell is currently 63 days.